Members of the Nalaga’at Theater Ensemble, who are deaf and blind, communicate by touch and touch-sign language. If Deuteronomy is right in saying that we do not live by bread alone, then Nalaga’at Theater Ensemble has your ticket. 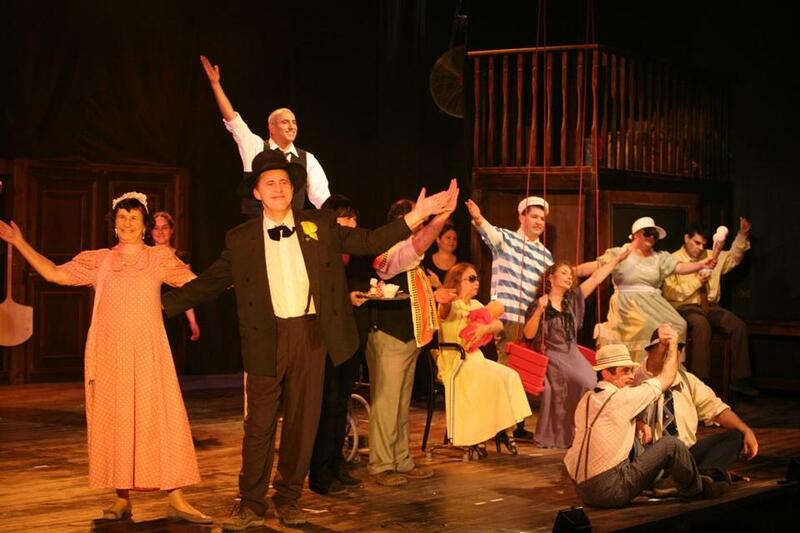 This troupe from Tel Aviv comprises 11 deaf-blind performers, who in the course of “Not by Bread Alone” bake bread onstage and share it with the audience. They also put on a funny, poignant, nourishing show. Swiss-born director Adina Tal cofounded Nalaga’at in 2002, and the organization now has a cultural center in Tel Aviv. Most of the actors have Usher syndrome: they’re born deaf and gradually lose their sight to retinitis pigmentosa. Some have traces of sight and hearing. What they all have is talent. Communicating by touch and touch-sign language, they move about on stage cued by the vibrations of a drum and guided by unobtrusive translators, who also sign for the audience. The actors express themselves in Hebrew and Russian; English supertitles are provided. 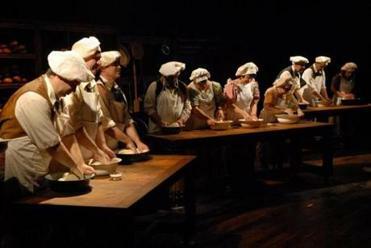 As the audience enters, 10 of the 11 troupe members are already onstage, standing behind three long wooden tables, in white aprons and bakers’ caps, their sleeves rolled to the elbow, kneading dough. Behind them are three large ovens, shelves stacked with loaves, kitchen utensils hanging from hooks, and a balcony on which, in time, the pope will appear. Downstage left, Itzik is seated at a Braille typewriter. A cheery khosidl plays on the sound system. Darkness and silence are recurring themes in this intermissionless 90-minute show. But so are dreams and ambitions and the small pleasures of life. Mark and Igor, the troupe’s clowns, mime eating and drinking while Bat-Sheva sits on a swing and Shoshana dances in a faint spotlight. Zipora gets to go to the movies with a big — really big — bucket of popcorn. There’s thunder and lightning; Itzik tells a “rain story” of being alone in the darkness and silence until his friends arrive; then the four women are seen sitting around a table and Genia tells Shoshana that this rain is nothing compared to the rain in Russia. The acting company Nalaga’at, made up of 12 deaf-blind participants, will perform “Not By Bread Alone” at Emerson Paramount Center Mainstage. One segment starts out as a tribute to their friend Michael, whose dream it was to perform in Italy. That cues the pizza aprons, the clotheslines, the Italian flag, the pope (Yuri) blessing us from the balcony, and Bat-Sheva passing herself off, quite credibly, as the Israeli Sophia Loren. But Bat-Sheva has her own dream: to have her hair done by the famous Yuriy, who’s so in demand that he’s making appointments, via receptionist Genia, for 2015 and 2016. Mark and Igor are already occupying the coveted two chairs, but Yuriy makes immediate room for Bat-Sheva. It ends, of course, with a wedding, Genia and Yuri under the chuppah, with flowers on the tables, the bread brought hot from the oven, and everyone else playing the guests and posing for pictures as the lighting simulates flashbulbs. Then the audience comes onstage to congratulate the happy couple and partake of the bread. Food for the body, food for the soul.